Who will start at quaterback for Texas Tech vs. Kansas? 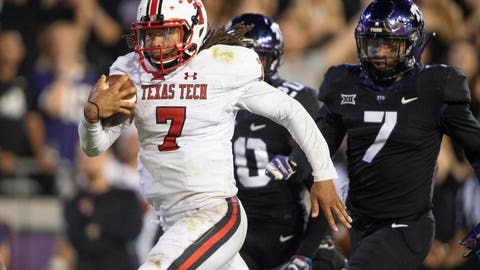 LUBBOCK, Texas (AP) — Jett Duffey is coming off a road win in his first career start, and Alan Bowman is now three weeks removed from a crunching hit that led to a partially collapsed lung. Toss in McLane Carter briefly replacing Duffey in Texas Tech’s last game, and there’s no telling who might start at quarterback Saturday when the Red Raiders (4-2, 2-1 Big 12) host Kansas (2-4, 0-3). As usual, coach Kliff Kingsbury isn’t saying. Logic points to the sophomore Duffey in part because he played through some inconsistencies to provide the decisive moment in a 17-14 win at TCU , dashing 38 yards up the middle for the go-ahead touchdown midway through the fourth quarter. Carter, a junior, replaced Duffey for one series but appeared limited by the sprained left ankle sustained in the opener. Bowman replaced Carter and was the nation’s leading passer when he was knocked out of a home loss to West Virginia. While sidestepping the question of whether Bowman was ready to return following an injury that put him in the hospital for four days , Kingsbury at least acknowledged early in the week that the true freshman had yet to participate in team drills in practice. The Jayhawks have lost 42 straight true Big 12 road games going into their first game since coach David Beaty fired offensive coordinator Doug Meacham during their open week. Beaty said he would call plays with help from the staff. Against TCU, the Red Raiders allowed their fewest points in a conference game since beating the Horned Frogs 20-10 in Kingsbury’s Big 12 debut five years ago. Texas Tech forced three turnovers, including Adrian Frye‘s clinching interception late. Pooka Williams Jr. became the first Kansas freshman to start his career with two 100-yard games, victories over Central Michigan and Rutgers that gave the Jayhawks a winning record going into Big 12 play. But he has yet to reach 100 yards in three league losses. The closest was 97 yards in a 48-28 loss to Oklahoma State. Despite the struggles against TCU, when Duffey had just 40 yards passing and 37 rushing before halftime, Texas Tech still leads the Big 12 in yards passing (373 per game) and total offense (552 yards per game), and is still in the top five nationally in both categories. Kansas’ last Big 12 road win was 35-33 at Iowa State on Oct. 4, 2008. The Jayhawks beat Missouri at Kansas City’s Arrowhead Stadium that season, and since has lost 44 straight conference games outside Lawrence. … Duffey’s running ability has the Red Raiders nearly breaking even on run vs. pass plays in the normally pass-happy offense. Texas Tech has 262 rushes and 270 passing attempts.